make up the Bernese Alps. When my editor put my name down for a media trip to cover the San Antonio Spurs and French basketballer Tony Parker playing an exhibition match at 3,545m in the Bernese Alps in Switzerland, I was not sure at first how to pack. Mid-September would still have agreeable temperatures in the low-lying areas, but up in the Aletschglacier, where the match would be held, wind chill might necessitate something thicker, along with waterproof boots for tramping through the snow. Covering the match between Parker’s French exhibition team Asvel and Swiss players from the country’s professional basketball league, would be three Malaysian writers, including myself. We boarded a Singapore Airlines flight to Changi Airport, and then transferred to a Swiss Air flight for Zurich, tickets courtesy of Jungfrau Railways, the sponsor for this trip and the exhibition match. 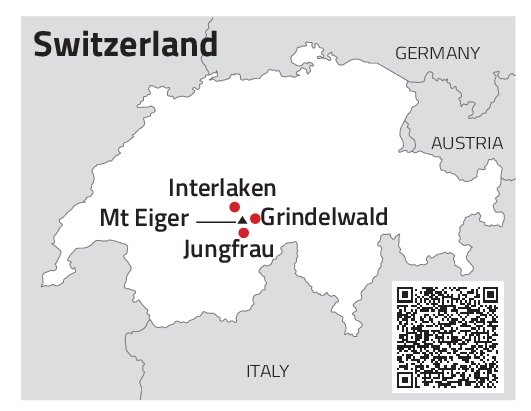 Stopping at the station of Interlaken Ost (“East”), we boarded a Jungfrau Railway train to Grindelwald, a tourist village about 40 minutes out from Interlaken. We put up at the Hotel Hirschen, along Grindelwald’s main Dorfstrasse road, for the duration of our stay.